As part of another problem, I wanted to see if it was possible to ensure that a key was only in one of two tables. This is shown in the example below where I want an employee to be either in the ActiveEmployee table, or the TerminatedEmployee table, but never both. 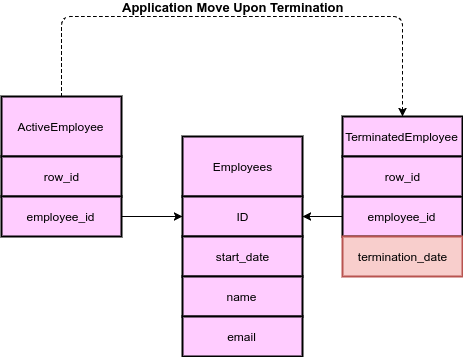 One could just use a single employees table with a nullable termination_date to identify whether an employee is active or terminated for this scenario. However this structure is in preparation for other relationships in future that are beyond the scope of this tutorial. You can use the commands below to set up the tables as shown above. Now how do I prevent the same employee being referenced in both the active and terminated tables? We can use triggers to prevent insertions on either table if the value is in the other. This trigger will prevent an employee being inserted into the active table if they are already in the terminated one. This trigger will prevent an employee being inserted into the terminated table if they are already in the active one. Now lets test this by creating an employee called John, and try to add him to both the active and terminated tables. # Create an active employee called John. # Erroneous attempt to insert the same employee into the terminated table. If you don't want to use signal for your triggers, you could achieve the same effect by setting the value to null as shown below, but this would create confusing error messages to the user. This would likely cause confusion for other users as they would see that they had provided a non-null value and might not realize a trigger was making it null.